Adam wanted to have a garden of his own. I told him, “Well, when Daddy starts planting in a couple weeks you can have your own garden spot but until then you can help me if you like. 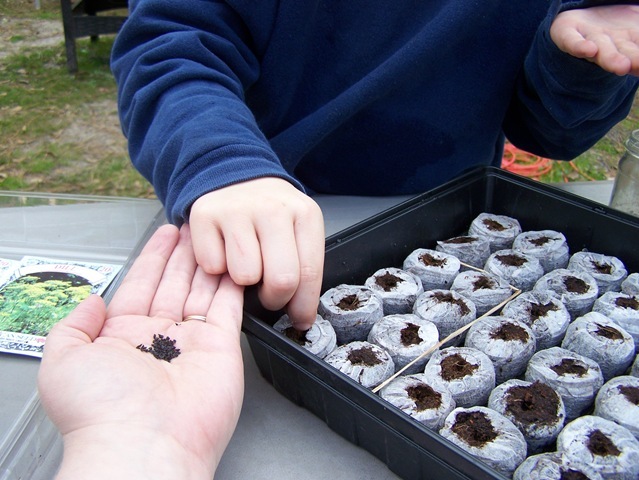 I am going to plant herbs.” “What is herbs?” Adam questions. “Spices!” I said. He thought that would be pretty neat to grow our own spices. I explain to him that we can grow them and dry them and store them ourselves. I bought one of the starter kits so it would be easier for Adam to help. We set up our stuff on the picnic table outside. The kit says to add 1/8 cup of water for each peat pellet. I get an old scoop and mark off 1/8 cup so he can “measure” it out. The “measuring it out” only lasted a few minutes then we just decided to pour the 10.5 cups of water needed all over the peat because we were impatient. In just a few minutes the little pellets absorbed all the water and grew twice their size. “Mom, why can’t we see them grow?” Adam says amazed that they were so much bigger so quick. “Because it happens slowly enough that our eyes can’t really see it.” was the best I could do for an answer but it satisfied him. 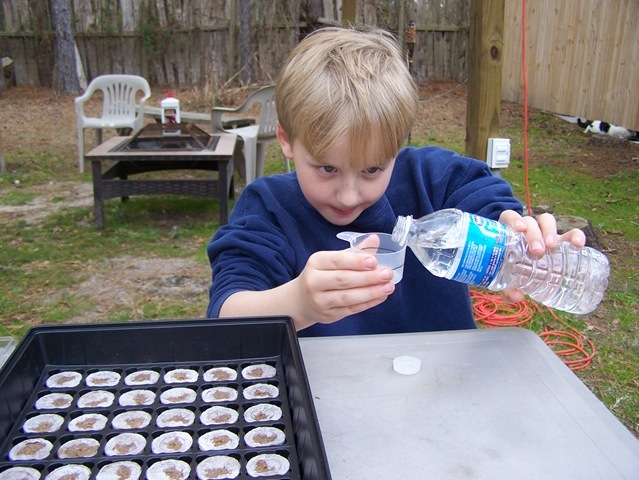 The little jar in his hand has some earthworms that Austin had brought over. I told them they are good for the soil so now they are being cherished so they can go in the garden later. 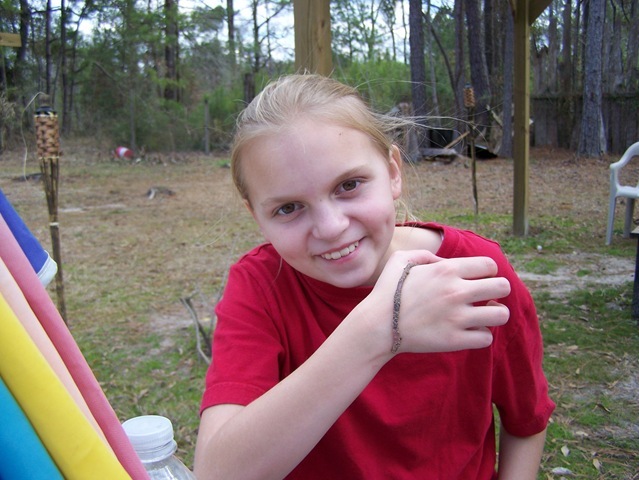 Anna with the earthworm. We look it over and figure out which end is the head and I give a quick explanation of the band around the worms belly, enough to satisfy their questions. We had purchased eight herbs from a local store, I figure for a experimental “kids garden” these would do, although I do prefer heirloom seeds when possible! Austin bought a pack of catnip seeds in hopes to experiment on his cats later to see if, in fact, it does change their behavior. We figure out that we have enough pellets to plant eight per type of herb. Adam takes a pinch while I hold the seeds for him. 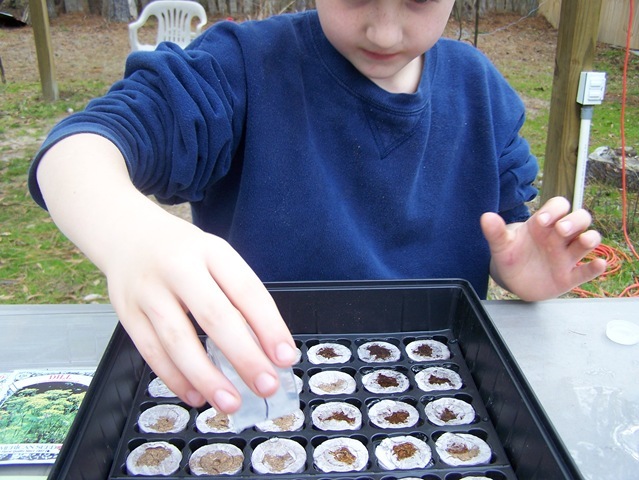 He is not crazy about dealing with the tiny seeds but was completely amazed by how small some of them were. He liked planting the larger coriander type the best. We took a stick and pushed the seeds down into the little hole and then fluffed the peat around them so that we could cover them up. Now we just have to wait for them to sprout. We can then plant them in a planter on my porch. In no time we should have fresh herbs to cook with. 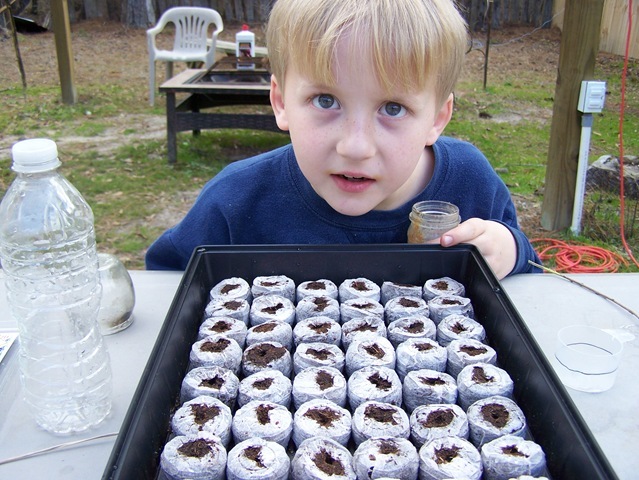 Posted on February 17, 2011, in Garden, Homeschool and tagged Herbs. Bookmark the permalink. Leave a comment.